This genus is accepted, and its native range is Myanmar. Perennial. Stolons present. Culms 10-30 cm long. Ligule an eciliate membrane. Inflorescence composed of racemes. Racemes single. Rhachis fragile at the nodes; angular. 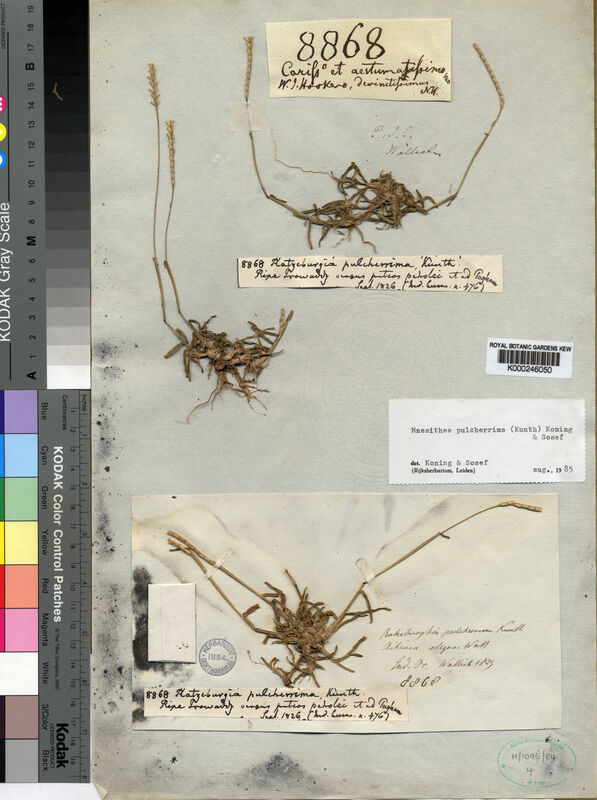 Rhachis internodes linear; together with the pedicel framing edges of sessile spikelets. Rhachis internode tip transverse; crateriform. Spikelets squeezed between internode and pedicel; in threes. Fertile spikelets sessile; 2 in the cluster. Companion sterile spikelets pedicelled; 1 in the cluster. Pedicels linear. Companion sterile spikelets rudimentary. Spikelets comprising 1 basal sterile florets; 1 fertile florets; without rhachilla extension. Spikelets oblong; dorsally compressed; 4.565-6.6 mm long; falling entire; deciduous with accessory branch structures. Spikelet callus base truncate; with central boss; attached transversely. Spikelets comprising 1 basal sterile florets; 1 fertile florets; without rhachilla extension. Spikelets oblong; dorsally compressed; 4.565-6.6 mm long; falling entire; deciduous with accessory branch structures. Spikelet callus base truncate; with central boss; attached transversely. Glumes exceeding apex of florets; firmer than fertile lemma. Lower glume oblong; indurate; 2-keeled; winged on keel. Lower glume surface cancellate. Upper glume oblong; coriaceous; 2-keeled; 3 -veined. Upper glume apex acute. Basal sterile florets barren; without significant palea. Lemma of lower sterile floret oblong; hyaline; 0 -veined; acute. Fertile lemma oblong; hyaline; without keel; 2 -veined. Lemma margins ciliolate. Lemma apex acute. Palea absent or minute.